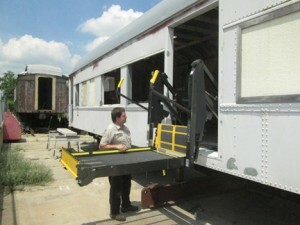 Although the renovation of the former Pullman Sleeper LaReine (10-1-1 for railroad buffs) into an ADA compliant railcar for operation on the Coopersville & Marne Railway has been a long drawn-out process, on Tuesday 16 July 2013 the focal point of the project, a wheelchair accessible loading lift was fitted. The lift is a donation by the Braun Corporation to the cause and was fitted to the railcar by Clock Conversions of Grand Rapids, MI. The Pullman Sleeper LaReine was originally built for and operated on the Louisville & Nashville’s crack, Panamerican Line running passengers from the central United States to Central America and the Caribbean. The depression saw it fall from star status and finally in 1948 sold to the Pennsylvania Railroad (PRR) as part of the anti-trust lawsuit against the Pullman Company. It was then leased back to Pullman and was the only car of this configuration in the PRR roster. It was put into government storage in 1957 as part of the national defense plan. In the 60s it was released from the Pullman leaseback and converted to work car service on the PRR as PRR #493827 (Track RS12) where the restroom lounges, drawing rooms as well as 4 of the 10 sleeping berth/sections were removed. Six berths were retained in the center of the car for crew sleeping quarters as well as the adjacent toilet which was formerly the private restroom of the drawingroom. After work car service the car went through several private collectors before being sold to the Industrial Heritage Society. Fundamentally sound the combination of the historical nature, the all-steel (heavyweight) construction as well as the open areas on either end of the car made it an ideal candidate for conversion to handicap accessibility. The Industrial Heritage Society has cut a hole in the steel wall, framed it up for a rollaway door and on Tuesday, 16 July 2013 installed a wheelchair lift. Prior to this stage, the roof was wire-wheel ground and primed a section at time due to restrictions placed on the crew by the adjacent homes in the downtown Coopersville C&M railyard in the fall of 2011. In December of 2011 with the assistance of West Shore Services, the car was moved to the industrial park off Comstock Street in Marne, Michigan where a C&M Volunteer had purchased a bank-owned lumber warehouse adjacent the C&M tracks. The railcar was lifted off the tracks by two Erickson Cranes and placed on steel I-beam cradles atop the cement apron between the tracks and the warehouse building. During the following winter, the entire floor was rebuilt & re-insulated. Interior wall surfaces have been coated with a rust conversion product while interior touchable surfaces were sandblasted as was the exterior. After cleanup the sandblasted surfaces had to quickly be primed before the bare metal could start rusting again. The roof primer was found to be failing and small annoying leaks persisted so the roof was cleaned and re-primed to overwinter the 2011-2012 season. This spring the roof has been re-caulked, completely sealed with an elastomeric coating and protected with a coating of exterior house paint. Although the lift has been fitted and tested, the exterior has to be painted, window sill repairs completed and windows installed (these were completed in Dec 2013) before the interior finishing can commence as soon as funding is available. The car still has a ways to go before it will be serviceable but the changes are readily evident. Accessibility planners are already placing the C&M RR along with the ADA Railcar on their scheduled stops for the 2015 seasons. Blog post by Philip Cok, WMSIH President along with resource materials from PRR Technical Society Magazine, LaReine to Live Again by James Winslow and Mlive/Advance Newspapers, Historic railcar goes for a ride by Jeff Cunningham.